Researchers at Clemson University in the U.S have shown that replacing lithium with aluminum and graphene may be key for next-gen batteries. Aluminum is regarded as non-toxic and much more plentiful than the lithium currently in widespread use (and cheaper). Aluminum also transfers energy more efficiently. Inside a battery, the element — lithium or aluminum — gives up some of its electrons, which flow through external wires to power a device. Because of their atomic structure, lithium ions can only provide one electron at a time; aluminum can give three at a time. That, the team says, is the real point of the switch. The electrode in a battery is like a bucket and the electrical charge is like sand inside the bucket. If the sand starts to flow out, the speed at which it flows is the current. The greater the speed (the larger the current) the quicker the bucket is empty and the sooner the battery goes flat. The more sand you store in the bucket, the longer the current lasts. The Clemson team seems to have found a way to pack more sand in the bucket and used tools to confirm the bucket was full. 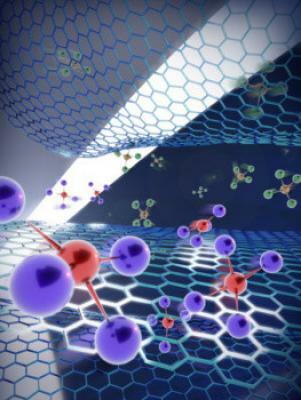 Their new battery technology uses aluminum foil and few-layer graphene as the electrode to store electrical charge from aluminum ions present in the electrolyte. The next step toward a commercially viable aluminum ion battery is lowering the cost. Although aluminum is relatively inexpensive, the electrolytes are pricey.